Sporting Equals is honoured to unveil its new Corporate Ambassador Mr Prof. Peter Virdee, as part of its Ambassador programme, supporting the future champions programme. This programme aims to help talented and dedicated young black and minority ethnic (BME) individuals to succeed at elite level sport, and serve as valuable role models to encourage other young people to get involved in sport. Sporting Equals is the national organisation promoting greater participation by the black and minority ethnic population in sport and a healthy lifestyle. The not-for profit organisation, is at the heart of BME communities through its network of 5,000 community organisations. As a national partner of Sport England and strategic advisor to DCMS they have partnership agreements and affiliations with the leading sports governing bodies. The objective of Future Champions is to recognise, celebrate and inspire. By shining a light on the stars of tomorrow, the programme not only nurtures talent but also encourages participation from other young people from similar backgrounds, motivated to get involved by the success of our Future Champions. Prof. Peter Virdee said “even if I can inspire one child to take up sport, through my Corporate Ambassador role with Sporting Equals, I will be happy”. Born and bred in the inner cities of Birmingham, earning his first pounds as a car minder, Prof. Peter is now a highly established business and property entrepreneur, one of the most iconic Sikh’s across the world. Peter’s journey can serve as an inspiration for other young people including those living in inner city areas. With the right mind set, drive and motivation, Prof. Peter experience provides evidence that nothing is impossible. Prof. Peter himself is an avid sportsman, playing badminton, polo and basketball as a way to both get fit and get into a mind frame of self-discipline that has helped him in his journey to business success. Prof. Peter believes that sport can provide many benefits and is a key tool to develop youngsters, helping them achieve their potential. Prof. Peter said “There is so much sporting talent in the Asian community, not just in the UK but worldwide. The Asian diaspora is one of the largest globally. Statistically we should be bringing through top talent in the professional sporting arena. However in reality this is not the case. I believe this is largely centred around the lack of encouragement for youngsters to take up sports at a grassroots level and role models to inspire them. We need to re-educate our community and try and change these mind-sets, especially those of the third generation parents. Investment should be targeted, developing facilities in inner city areas with high levels of social deprivation including cities with high concentration of Asian communities to further encourage them to get involved in sport”. Arun Kang CEO at Sporting Equals said, “On behalf of the board and the team we are delighted to welcome Prof. Peter as a Corporate Ambassador. Prof. Peter brings a wealth of experience, drive, vision and strong networks all will considerably enhance our offer. As a philanthropist he has supported numerous good causes and charities both at home and abroad and has witnessed how sport can be utilised to bring communities together”. Prof. Peter said, “As my offices are based in Central London, I witnessed firsthand the energy around London during the summer it was truly incredible. Bridging gaps in society as well as highlighting the many sports that are available for youngsters to participate in. The time is now to build on the positives that the London 2012 Olympic and Paralympic games have left, carrying forward the legacy as we should be encouraging more young people into sport”. “Through my role as an Ambassador of Sporting Equals, I will work with the organisation to make this happen. I believe in giving back to the community, and via Sporting Equals I will further help build a better future for kids in our community. The key is to polish these ‘un-cut’ diamonds from the Asian community and develop them into the bright sports persons that we all know they can be”. Commenting on the Future Champions programme Prof. Peter said, “I was ecstatic watching the Bhangra dancers at the opening ceremony. This showcased the Asian community’s strong presence in the UK. However what was disappointing was the lack of Asians in the top tier, participating and winning medals”. Arun said “London 2012 showed the very low number of British Asian’s participating in the Olympic and Paralympic games, and Prof. Peter will help to increase interest within Asian families, businesses, communities and faith centres to ensure British Asians are not missing at Olympic and Paralympic games in the future”. Prof. Peter added “Hopefully this will kick start the Asian community to get into sports, however, this will take time and the right encouragement for youngsters at a grassroots level to help us find more elite talent through this programme. I am confident that we will be watching British Asians winning the gold’s, silver’s and bronze medals in years to come”. For more information, please contact David Mbaziira, Head of Marketing & Communications on 0121 777 1375. For further information about Sporting Equals, please visit the website at www.sportingequals.org.uk. I was honoured to be recognised by the Chief Khalsa Diwan as a prominent Sikh personality on the occasion of the 64th All India Sikh Educational Conference held at Ludhiana on 9 November 2012. Chief Khalsa Diwan Charitable Society is a 110 year old institution of Sikhs. It was established in 1902. S. Arjan Singh Ji Bagrian was the founder President and S. Sunder Singh Ji Majithia was its first Honorary Secretary. For promoting education among Sikhs, Chief Khalsa Diwan Charitable Society established a new organisation – Educational Committee in 1908. The aim of the educational committee was not only to spread education but also to promote the philosophy of Chief Khalsa Diwan Charitable Society to make the common masses aware of the importance of education. Since then, the Educational Committee of the Chief Khalsa Diwan Charitable Society has organised 63 Educational Conferences in various parts of the country. Wherever the Educational Committee used to organise and Educational Conference, a new educational institution was established at that place, with the efforts of the supporters of Chief Khalsa Diwan Charitable Society. The first conference of the Educational Committee was held in 1908 in Gujranwala (now in Pakistan) and after that Khalsa High School came into being there. Thirty Three Educational Conferences were organised by this committee till 1946. Various prominent political personalities honoured these Educational Conferences with their gracious presence from time to time. Before 1947, the famous personalities who attended these conferences included royal personages. The prominent personalities who attended the Educational Conferences after the Independence are former Presidents of India, Dr Rajindra Prasad, Dr Zakir Hussain, Shree Fakhar-u-Din-Ali Ahmed, Dr G.S. Pathak – Vice President, Pandit Jawahar Lal Nehru, Prime Minister, S. Sawarn Singh – Defence Minister Govt. Of India, Shri M. C. Chagla Chief Justice Bombay High Court, Shri K.M. Munshi Governor Uttar Pradesh, Shri Mangal Das Ji Pakwasa, Governor Maharashtra, S. Ujjal Singh Governor Punjab, S. Partap Singh Ji Kairon Chief Minister Punjab, Giani Zail Singh Chief Minister Punjab, Capt. Amrinder Singh Chief Minister Punjab, S. Parkash Singh Badal Chief Minister Punjab. The prominent personalities who gave Presidential Addresses in such conferences of Educational Committee of Chief Khalsa Diwan to give direction in field of education were S. Baghail Singh Ji Rias, S. Joginder Singh Ji Rais, Kanwar Daljit Singh Ji, S. Sunder Singh Ji Majithia, Dewan Leela Ram SinghJi, Sant Attar Singh Ji Maustuana, S. Kharak Singh Ji Rias, S. Harbans Singh JI Attari, S. Shivdev Singh Ji Rias, Principal Jodh Singh Ji, Prof. Puran Singh Ji, Bhai Kahan Singh Ji Nabha. Before 1947 the educational conferences organised by the Educational Committee left such marks that the number of educationasl institutions rose from 7 to over 600. After the partition in 1947, the economic condition of the Sikhs deteriorated badly, because of which many schools were either closed or were handed over to the government by the Managing Committees. In 1967, Chief Khalsa Diwan Charitable Society passed a resolution to establish schools under the banner of Sri Guru Harkrishan Ji; the 8th Guru and the first such school was established in Amritsar. At present more than 45 schools, Central Khalsa Orphanage (Amritsar) Old-Age Home (Tarn Taran), Hospitals, Homeopathic dispensaries, Dental Clinics, Sangeet Vidyalayas, Dharam Parcher committees etc are being run under the aegis of Chief Khalsa Diwan Charitable Society which not only provide quality education but also make efforts to inculcate among students the spirit of Sikhism. It has already added two Adarsh schools at Dhandran (Ludhiana) & Naushera Pannua (Tarn Taran) in collaboration with Punjab Government under the name of Punjab Government CKD Adarsh Schools. Educational Committee of Chief Khalsa Diwan Charitable Society, Amritsar has now entered into the field of Technical, Vocational & Professioanl Education. Consequently, it has already started CKD International College of Nursing & CKD Institute of Management & Technology in Amritsar. The project of CKD Institute of Management & Technology at Tarn Taran & CKD Institute of Liberal Arts at Amritsar, are under consideration. 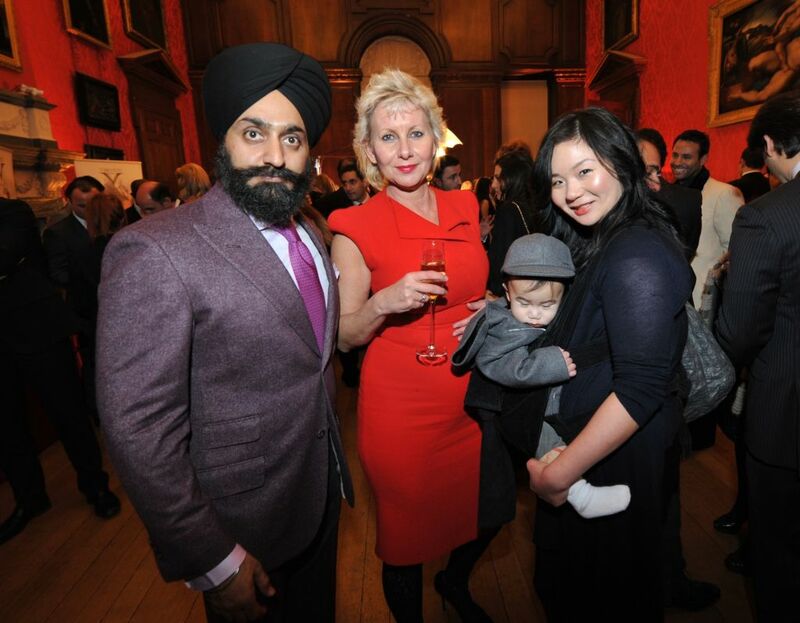 Prof. Peter Virdee, Francis Card, Lisa Tse and the one and only Master Tse. Rolls-Royce invited a select 100 customers to “dine on the line”, transforming the factory where all Rolls cars are hand built into an exclusive event. Rolls-Royce invited a select 100 customers to “dine on the line”, transforming the factory where all Rolls cars are hand built into an exclusive event. I was fortunate enough to be invited along with other select customers who were introduced to some of the skilled men and women who are responsible for putting these cars together, and even got to try their hand at applying the perfect coat of paint on a Phantom Extended Wheelbase. The occasion was used to introduce the attendees to the Phantom Series II lineup. Speaking about how Sikhs contribute to prosperity in Britain, Dr Cable highlighted the importance of the links the community provide with India – and defended the need to continue giving aid to the subcontinent to address issues such as poverty. The audience heard from a panel of leading Sikh business leaders who discussed how they had developed their enterprises – and how they hope to support the development of future Sikh talent. Business Tycoon, Prof. Peter Singh Virdee, announced a new fund to be launched later this year, solely for Sikhs who have a cutting edge idea are in need of finance. This group of prominent Sikhs in British business lead by Mr Virdee, would advise, nurture and guide any worldwide Sikh initiative, to ensure the creation of more wealth and prosperity in the hands of the Sikh community. Mr Virdee described how he felt there was a gap in the market to support creative ideas with a soft loan, without the obligation to take profit or shares. The evening was the first in a special week long series of events marking the 313th anniversary of the creation of the Khalsa Brotherhood – a pivotal moment in 1699 which defined the Sikh community. ‘Turbanology at Vaisakhi’ incorporates the key components of the ‘Sikhs Unwrapped’ exhibition with a new film commission by hosts Ernst & Young Sikh Group which captures prominent Sikhs speaking out about what their Turban identity means to them. Was honoured to attend one of the most exclusive events in london The Faberge Big Egg Banquet hosted by no other then Faberge themselves. Other guests included Holly Valance, Tamara Ecclestone, Nick Candy, Lisa Butcher, Lisa Tchenguiz and Ella Krasner. Look out for the Eggs as its all for a good cause. The Launch of Luxury Alliance a brand consultancy and marketing company which was held at the Royal Kensington Palace with equally important guests and friends alike. For more information about Luxury Alliance please see the link below. MF Husain dubbed the Picasso of India who sadly died in London on 9th June 2011, aged 95 however myself along with others met in London to celebrate his life and works. Close friends of M.F. Husain, who have collected his works for many decades, held a very private and very subtle exhibition last night of a couple of dozen of his paintings at the Royal Academy in London. The paintings were full of colour and dash and included not only Husain’s trademark horses but also Hindu deities as well as family and witty self-portraits. Collectively they did look amazing, all present agreed. It was an honour to be involved in this event but furthermore to have met the legend and to have spent some evenings in his company. Prof. Peter Virdee born and raised in Birmingham has been working in the property business for the last 19 years. Prof. Peter is a founding Partner of B & S Property and has interests in numerous other businesses. B & S Property has set up HK & JH Charitable Trust which contributes significantly in relieving people all over the world of their hardship or distress as a result of local, national or international disaster or by reason of social or economic circumstances. Prof. Peter has had an invaluable impact through his commitment and dedication in supporting worldwide causes. Over the years, a considerable amount has been donated to various charities, including The Princes Trust (www.princes-trust.org.uk), Mencap (www.mencap.org.uk), Sense International (www.senseinternational.org.uk), British Red Cross Chile (www.redcross.org.uk), Marie Curie Cancer Care (www.mariecurie.org.uk), The Jaralam Trust as well as contributions towards the Tsunami disaster. Last year, through supporting the Caudwell Charity (caudwellchildren.com), we were able to pay for terminally ill children to go to Disney land. With regards to other social entrepreneurial charity work, Prof. Peter has an aspiration to work hard and create enough wealth in order to donate 50% of his wealth to charitable causes. He has solely set up Sardar Jagat Singh Charitable Trust in India (named after his late grandfather) which has successfully carried out 400 cataract operations from start to finish. The charity has sponsored 80 children starting from primary education in the hope that this sponsorship will lead to future scholarships. Furthermore he’s UK based contribution and donations are made through The Virdee Foundation (www.petervirdee.com). This same charitable trust has provided support to Bharuch Welfare Hospital based in Gujarat which holds 700 beds. This Charity has made a positive contribution to the Gujarat crisis whereby 172 houses were built in the area following the earthquake in 2001. Prof. Peter is a Patron of the NSPCC (www.nspcc.org.uk), in support of this charity he has contributed a substantial amount of money in helping to build Hargreaves Centre in Merseyside. Alongside this children’s charitable work, he has had a large amount of involvement in the Full Stop Appeal. Through being an active supporter of the Guru Ram Das Project (www.grdp.co.uk) he has been able to sponsor The Women’s Alcohol Service at Foundation 66. This sponsorship will ensure that women who suffer from drug and alcohol abuse and those who are affected by domestic violence will continue to receive support for an additional year. Prof. Peter has personally (through his own wealth) sponsored a number of other charities which are close to his heart including Variety Club (www.varietyclub.org.uk), Living the Dream Trust (www.livingthedreambandd.org.uk/), Leonard Cheshire Disability (www.lcdisability.org) and Cancer Research UK (www.cancerresearchuk.org). In his desire to assist disadvantaged children in the developing world he has helped to build St Paul’s Children Care Centre in Nairobi. Currently he is he first Sikh Patron on the board of the English National Opera and sits on the UK philanthropy board of Coutts & Co Private bank UK, in recent times he has been invited to St James Palace to meet the Queen and was part of a select Sikh Delegation to welcome HRH The Prince of Wales at the Indian war memorial in Neuve-Chapelle in France. In 2010 Prof. Peter was given the honour of laying a wreath along side Baroness Thatcher to commemorate those who contributed to the 1st and 2nd World Wars. (www.bandshomes.co.uk). Recent initiative and involvements also include supporting the Loomba Trust which supports widows around the world, Sankara eye foundation which has helped 730,000 regain sight to date, the Libya Foundation which raised over £500k in one night alone and Pratham a childrens education charity which rasied over £2.2m in one single event. Prof. Peter Virdee has been honored and is delighted to be joining the board of Coutts & Co Private Bank UK Philanthropy. Francis Bacon (1561-1626) British statesman and philosopher. Coutts private bank, have an impressive 300 years history of involvement in the charity sector. Most famously, Angela Burdett-Coutts was one of the greatest Victorian philanthropists of her day making unprecedented inroads into helping those less fortunate than herself. Today this charitable tradition is proudly upheld. The Coutts Charitable Trust and the Coutts Foundation maximize the impact of giving by supporting numerous good causes. Unquestionably by far the most important part of Prof. Peter Virdee’s values and beliefs is that of helping others, those that are in need. In recognition of Peter’s contributions and willingness to always help others in need, Prof. Peter has been requested to sit on the Coutts UK Philanthropy board.